15 minutes to the White House! 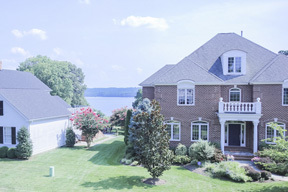 Potomac River Views and Parkland Surround! 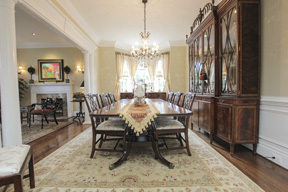 A rare offering, this spectacular Georgian Colonial enjoys panoramic views of the Potomac River in Alexandria Virginia. Custom built by a master builder, this lovely home boasts an open plan with a true cook's kitchen and exudes a luxurious European style. Location, Location, Location … an easy commute to Washington DC via Historic George Washington Parkway, enjoy scenic Parkland with miles of walking and biking trails, ten minutes to world class shops & restaurants in Historic Old Town Alexandria, and convenient access to three International Airports! RESIDENCE The distinguished exterior is tailored in red brick with inviting double glass-door entry, tall windows and an upper level balcony. The interior is defined by generously proportioned rooms framed with ornamental details, 10’ ceilings and intricate crown moldings. Combining timeless formal and informal living space, the home boasts panoramic views of the Potomac River and open views of the gardens surround. 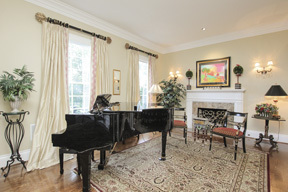 Beautifully appointed with fine architectural details, the residence includes a two-story central hall staircase, elegant formal living and dining rooms, a private library, a gourmet kitchen with a large center island, convenient laundry room, large sunny breakfast room, open family room with handsome stone fireplace and oversized three-bay garage with built-in storage. 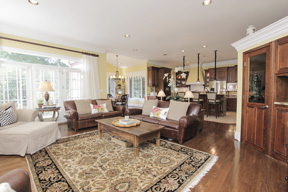 The two front bedrooms and center study area offer spectacular river views and adjoin a sunny balcony. 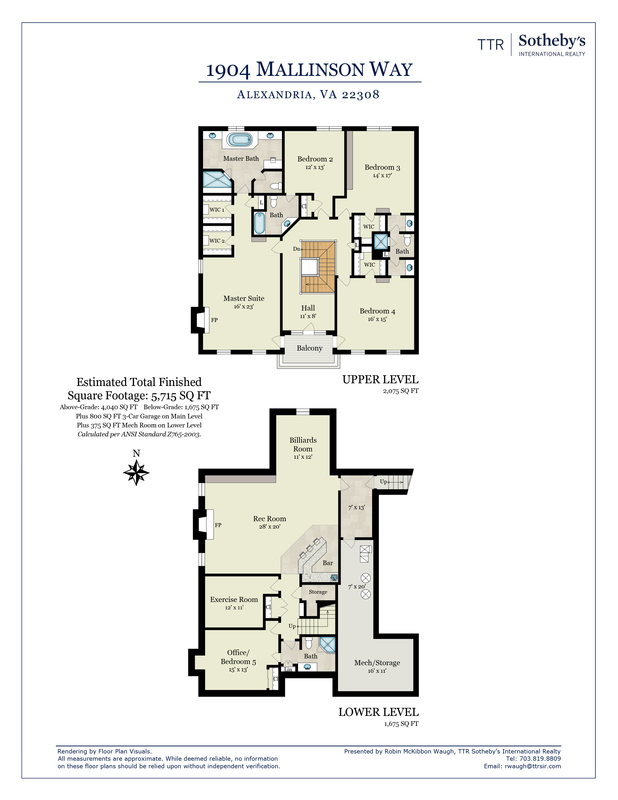 There are four spacious bedrooms, four luxurious baths, two beautiful half baths, four gas fireplaces, the lower level features 2 large sleeping area dens, a marble bath, open media room with a grand stone fireplace, adjacent game room, large wet bar and a spacious storage room. This gracious home offers every amenity, including gleaming hardwood flooring, stainless steel top-of-the-line appliances, beautiful custom-built cabinetry with granite countertops, whole house audio with surround sound, camera security system, professionally landscaped with beautiful fenced level yard and in-ground automatic sprinkler system. LOCATION The timeless appeal of Mount Vernon is legendary. Today, this is still one of the most attractive regions in Virginia, defined by the picturesque and historic George Washington Parkway with tree-lined roads that wind past gracious homes and historic properties along The Potomac River. Grand View on The Potomac was one of five original farms of President George Washington’s beloved estate, Mount Vernon. Approached via GW Parkway, stately stone pillars mark the entrance of Grand View, encompassing six private estate homes overlooking the Potomac River with acres of lush natural beauty. Fifteen minutes south of Washington DC, Mallinson Way is just minutes to our area’s exceptional fine dining, shopping, art galleries, museums, cultural art centers, marinas, bike trails, 3 international airports and historic Old Town Alexandria. 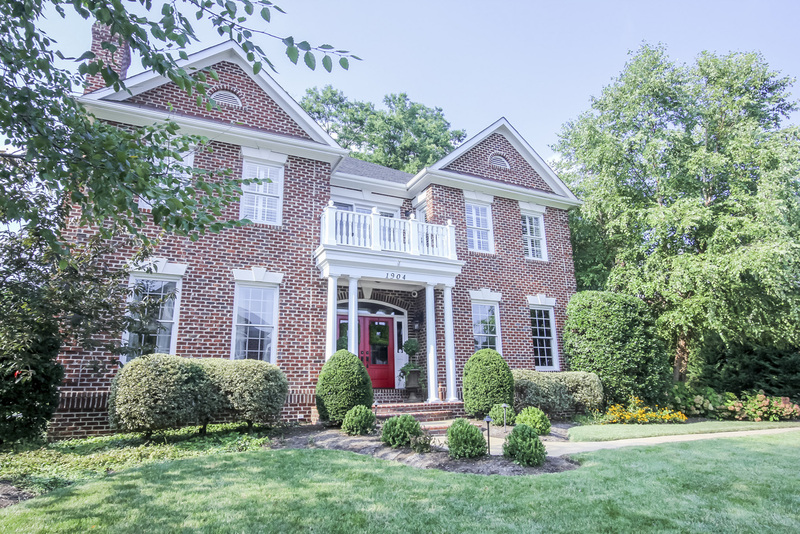 This handsome colonial exudes European style with tall ceilings and an open plan, abundant lush greenery outlines the residence, with sweeping views of The Potomac River! LIVING ROOM The stunning formal living room displays a gas fireplace with marble surround, intricate dentil moulding, matching tall columns, high ceilings and gleaming hardwood floors. 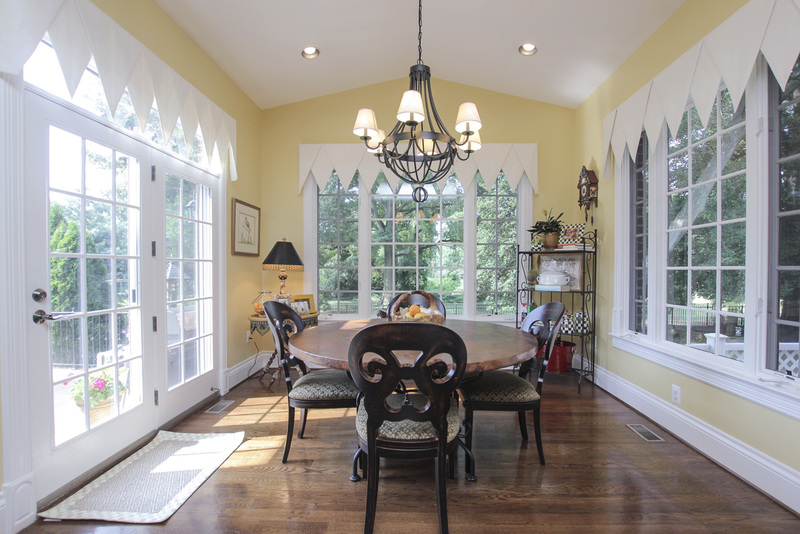 Nine- over-nine windows admit abundant natural light and overlook the front gardens. 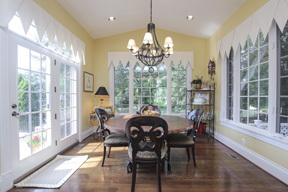 DINING ROOM The spacious formal dining room is distinguished by an elegant crystal chandelier, designer hand-painted walls, sunny bay window, gleaming oak floors, high ceilings, paneled wainscoting and crown moldings. 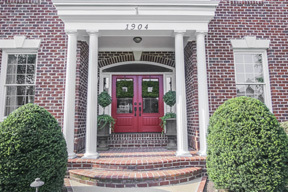 ENTRANCE The main entrance is framed by matching double columns, masonry portico with glass French doors, sidelights and transom that open into the gracious two-story foyer with beautiful turned staircase, accented with custom wood handrail, newels and wrought iron balusters. 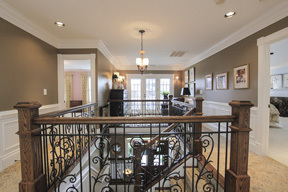 Traditional, intricate crown molding, custom millwork, columns and wainscoting seam the public rooms. 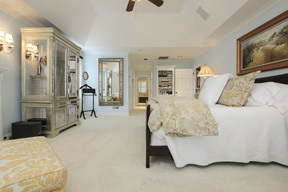 A powder room is conveniently located off the main center hall. LANDSCAPING Professionally landscaped garden beds line the foundation walls, lofty deciduous and evergreen trees provide privacy, a wide concrete driveway for ample parking and a tall metal-crafted fence lines the rear property’s expansive perimeter. Landscape lighting and plantings enhance the setting amid a dense carpet of lawn, both front and rear. 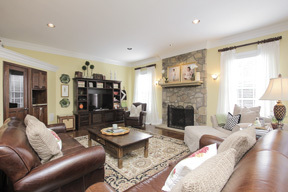 FAMILY ROOM This is where the family gathers, privately located off of the kitchen, features built-in bookshelves, hardwood flooring, high ceiling, crown molding and gas fireplace with stone surround. Double atrium doors with transoms open to a lovely outside terrace for al fresco dining and peaceful views of the river and lovely gardens. KITCHEN The open kitchen complex comprises a vaulted-ceiling breakfast area and gourmet’s professional haven with custom cherry cabinetry, granite countertops, ceramic backsplash, tiled floors, center island with breakfast bar, dual sinks, top-of-the line stainless steel appliances including 6-burner gas cooktop and double wall ovens, wine cooler, recipe-center desk and adjacent laundry room. BREAKFAST ROOM The breakfast area is sunny and bright, with atrium doors opening to a lovely outside patio, with river views. MASTER SUITE The master suite is perfectly proportioned, the master bedroom features a high ceiling, gas fireplace, carpeting, two walk-in closets, glass-enclosed closet and built-in shelving. 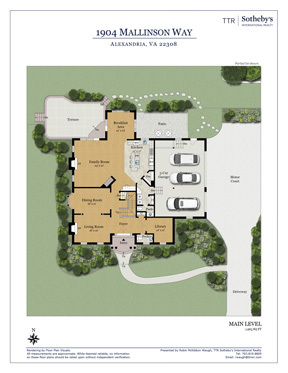 An atrium door opens to the outdoor balcony with sweeping views of the front gardens and The Potomac River. The elegant master bath is a veritable spa with elegant marble shower, spa bath, matching vanities and dressing table with marble tops, and private water closet. 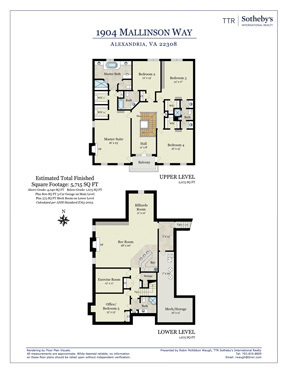 Come Home to Historic Alexandria Virginia! 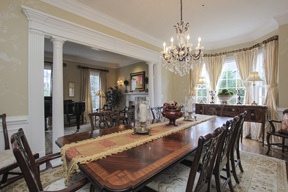 Classical Elegance for Family Gatherings or Gracious Entertaining! The distinguished exterior is tailored in red brick with double glass door entry, tall windows and an upper level balcony off of 3 rooms. 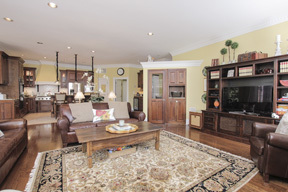 The stunning formal living room displays a gas fireplace with marble surround, intricate dentil moulding, matching tall columns, high ceilings and gleaming hardwood floors. Nine-over-nine windows admit abundant natural light and overlook the front gardens with spectacular views of The Potomac River! 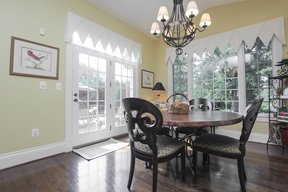 The spacious formal dining room is distinguished by it's crystal chandelier, designer hand-painted walls, sunny bay window, gleaming oak floors, high ceilings, paneled wainscoting and crown mouldings. Classic stone fireplace with gas logs, custom built-in cabinetry, gleaming hardwood floors, matching atrium doors lead to rear patio and gardens. Custom cherry cabinetry, granite countertops, center island, top-of-the-line, stainless steel appliances, 6-burner gas cooktop, 2 wall ovens, wine cooler, 2 sinks, ceramic backsplash and recipe center desk. The interior is defined by generously proportioned rooms framed by ornamental details, 10' ceilings and intricate crown dentil mouldings. Combining timeless formal and informal living space, the home boasts open and airy views of the property and gardens surround. Craftsmanship at it's best! A Room with A View ...from the Top! Resplendent with soft colors, Sumptuous bedroom with fireplace and balcony with River Views, for the ultimate escape and relaxation! 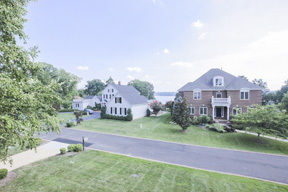 Quiet cul-de-sac of 6 privately sited homes, with sweeping Potomac River Views! Majestically sited above the Historic Parkway and George Washington's Potomac River, for easy access to all your recreation needs! Biking, Hiking, Walking, Paddling, Picnicing and more! 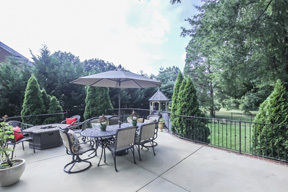 Al Fresco dining right off the Family Room! 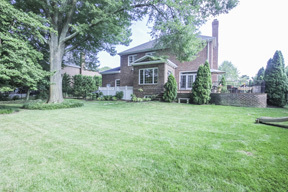 Opens to rear patio and fenced gardens for large family entertaining! Welcoming Double Glass Door Entry! Resplendent with happy tones ...a retreat, complete with balcony and River Views!